If you want to change the wrist in which you wear Apple Watch, you can do so without having a cumbersome button experience by choosing to switch the devices orientation. This also insures the devices screen will show properly, otherwise if you simply move the Watch from one wrist to the other, the display would be upside down. Also, you may find this helpful if you want to wear the Apple Watch on the same wrist, but simply wish to change the devices digital crown orientation as well. 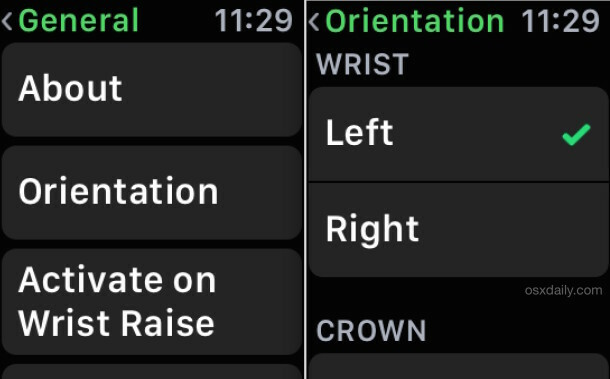 You can also make this adjustment from the paired iPhone by opening the Watch app, going to “My Watch”, and then to General settings and finding “Watch Orientation”, the effect is the same either way. Of course, you could switch the Watch to another wrist without making this change, and as long as you didn’t flip the device, it would still work the same, but obviously the two side buttons, which are necessary for screen shots, navigating certain features, and powering on the device, would be a bit more difficult to access. Thus, if you’re going change the wrist wearing the Apple Watch, do yourself a favor and adjust the settings to accommodate the change, it works much better this way.